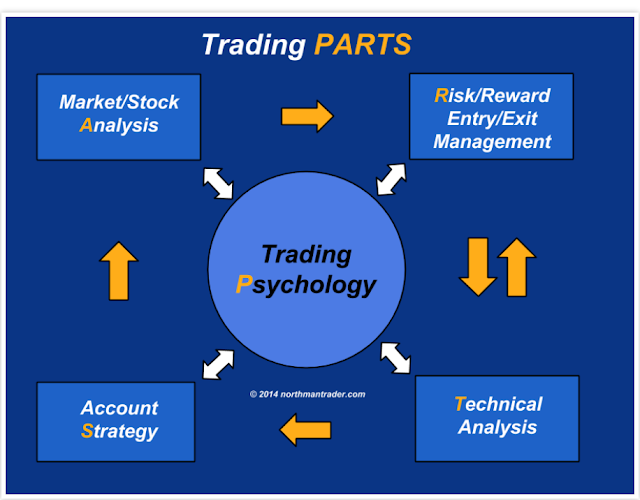 pattern indicates a strong price reversal from a bull market to a bear market. The three black crows help to confirm that a bull market has ended and market sentiment has turned negative. In Japanese Candlestick Charting Techniques, technical analyst Steve Nison says "The three black crows would likely be useful for longer-term traders. This candlestick pattern has a counterpart known as the Three white soldiers, whose attributes help identify a bullish reversal or market upswing. 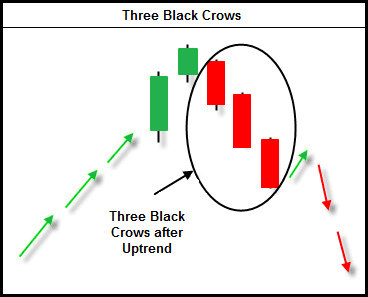 The three black crows candle formation does not happen very frequently in stock trading, but when it does occur swing traders should be very alert to the crow's caw. The candlestick's metaphor is three crows sitting in a tall three. On the day the first black crow makes its appearance, the formation is most predictive if the first "crow" -- or dark candlestick -- closes below the previous candle's real body. pattern is formed. Since there has been intense selling throughout the pattern, the stock may be overextended to the downside. However, if the stock continues its negative pattern on the fourth day, then it is likely that the issue is going much lower.